I’ve had a thing for raisins lately. I just can’t get enough of them. Since I’ve practically been dreaming of the “perfect” oatmeal cookie, it was no surprise that I whipped these up last night. These came pretty close to being “perfect.” They were moist, sweet, and melted in my mouth. I made them yesterday and a little more than half of them have already disappeared. I’ve been one very happy oatmeal cookie-loving lady. 1- Preheat the oven to 350 degrees. 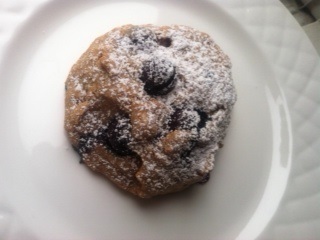 Then whisk the flour, oats, raisins, walnuts, baking powder, cinnamon, and salt together. 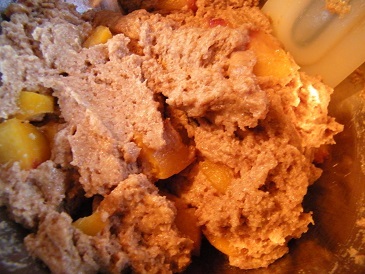 2- In a separate bowl, combine the rest of the ingredients (the vegan butter, applesauce, vanilla, and sugar). Mix the wet ingredients. 4- Add the wet ingredients to the dry. Make sure you stir the batter enough so all of the oats are coated by the wet ingredients. Note that the batter will be very moist. 5- Line a baking sheet with parchment paper. 5- On a lined baking sheet, drop cookies onto a baking sheet using a tablespoon. You may have to form them a bit just to make sure that all of the cookie stays together (as the batter crumbles easily before baking). 6- Bake for about 10 minutes (depending on your oven). When they are finished the bottom should be a golden brown color. 7- Let the cookies sit on the baking sheet for about five minutes and then move them over to a cooling rack for five minutes or so. Note that the cookies are fragile when they immediately come out of the oven, so be gentle when taking them off of the cookie sheet. 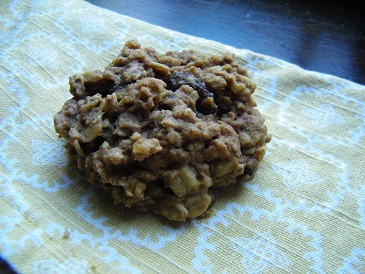 In case you missed my recipe for oatmeal chocolate chip cookies, find it here! About two Thanksgivings ago I ate ten desserts in that one day. Yes, I admit it. It happened and I certainly didn’t feel good afterwards, but the eating part was so wonderful I just couldn’t stop myself. I shoved my mouth full of my grandma’s ricotta cheesecake, pumpkin and apple pies, as well as many different types of cookies and cake. Now, I know that ten sounds like a lot, but I’m a grazer by nature. I like to nibble on lots of different types of foods. It wasn’t like I just plowed through ten full size desserts, though I must admit, that would be impressive. Really, what led me to eating my plateful(s) of mini-sized desserts and what also let me to bake four versions of coconut macaroons is my indecisiveness. Who could make just one version? Certainly not me. Nope, I needed to make four and I’m sure I ate nearly half of them myself. I mean when you bring these things to a function (and they’re the only dessert there you can eat), you’re going to devour a bunch of them just because of how delicious they are. These macaroons hit the spot (all four versions). They were lightly crunchy on the outside and oh so moist on the inside. 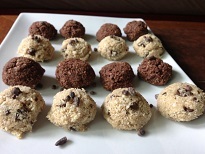 The citrus macaroons were refreshing, while on the other hand, the chocolate and chocolate chip ones were decadent. You choose or don’t and make multiple types of macaroons like I did (I certainly didn’t regret it, especially since these aren’t all that bad for you). 1- Preheat the oven to 275 degrees and cover a cookie sheet with parchment paper. Then combine the dry ingredients in a bowl. Whisk them together. Then add in the syrup, the melted coconut oil, and any citrus juice or vanilla extract. Mix well. 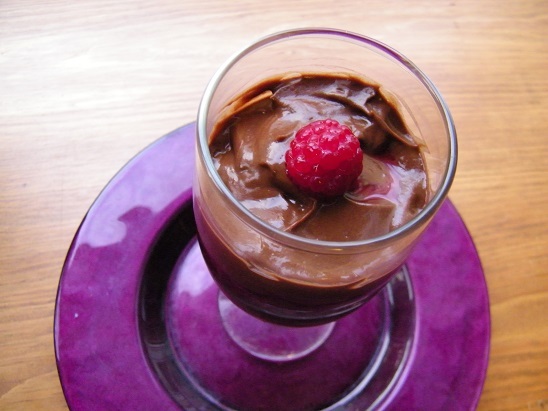 *If you are creating the chocolate version – add the extra maple syrup and the cocoa powder now. 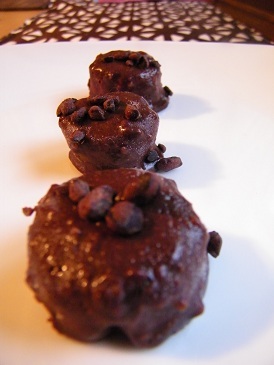 2- Fold in the chocolate chips if creating the chocolate or chocolate chip macaroons. Then use a medium sized-melon baller to create even sized macaroons. Space them evenly apart on the cookie sheet (they don’t need too much room in between because they don’t spread at all). 3- Bake them for 20-22 minutes. They should be slightly crisp on the outside when you pull them out. 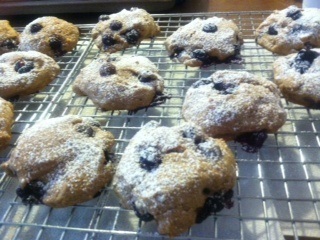 Let them cool completely before serving (though I’m sure they would taste good warm too). Top the citrus macaroons each with a pinch of fresh zest. These were delicious. I wouldn’t have made them if there wasn’t a special occasion because otherwise I would have eaten them all on my own. They were that good. My love for scones came rather late in life. I have to admit that I only really began to enjoy them about two summers ago. Oh how I’ve missed out on these delicious baked goods. 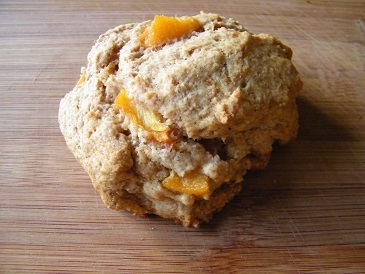 These ginger peach scones were just delicious- they were light, filled with flavor, and slightly moist. In short, they were everything a scone should be. No hockey pucks here. Just a tasty baked treat. As Shannon from Move Eat Create said, they make wonderful comfort food. I made them and then promptly ate two as soon as they came out of the oven. They were that irresistible I had to start making up for all those scones I’ve missed out on eating over the years. 1- Preheat the oven to 350 degrees. Then heat the one and a half teaspoons of coconut oil in a frying pan over medium heat. When its melted, add the peach slices. Turn them to allow for even cooking and to make sure both sides defrost evenly (if they are frozen). Allow the peaches to cook until they begin to soften (about 5 minutes). Then add the coconut sugar and the ginger. Stir and allow the mixture to cook for about 1-2 more minutes. Then take the peaches off the heat and allow them to cool. 3- Then, after melting the 1/3 cup of coconut oil, combine the coconut oil, agave nectar, ginger, and vanilla extract. Stir once and then pour over the spelt mixture. Gently mix together. 5- Cut the peach slices into 1/2 inch chunks and fold them into the batter. Use a 1/4 cup measure to spoon batter onto a parchment-lined baking sheet (to ensure that the scones will be the same size). Bake the scones for 15-20 minutes or until they are golden brown on top. 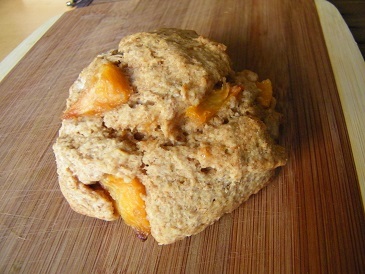 (If you had any juice left from sauteing the peaches, drizzle it over top of the scones). These kept well in an air tight container for 3-4 days. I stored mine in the fridge and heated them in the microwave before eating. My love for scones lives on. Especially when they are as light and fluffy as these. 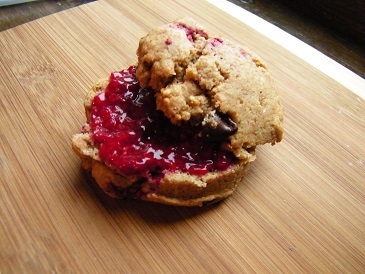 Feel free to post any of your favorite scone recipes and flavor combinations! If patience isn’t a quality you pride yourself on having, then making popcorn the old-fashioned way may not be for you. I’ve always been one of those antsy people waiting in line, only wanting to be out of line. I’m also guilty of being a slightly worse version of myself when hunger creeps up on me and there are no snacks in sight. As you can imagine, when I was waiting for this popcorn to pop, it felt like I was a kid waiting for summer vacation to arrive a few days before school ended. All I wanted to do was somehow help the popcorn along to start that magical popping process. Instead, I just waited. Let me tell you, while you are waiting for your popcorn to pop you can get a lot done. This is the upside of it taking a while for the popcorn to begin popping in the first place. You can wash your dishes, make your bed, work out your abs, or possibly even look up the science behind why popcorn pops (believe it or not there is water in that little kernel). I will admit to washing the dishes, but I didn’t look up how popcorn pops or workout my abs (mainly because that is my least favorite area to workout). I didn’t have that much time. Maybe next time. In any event, all that waiting was so worth it. 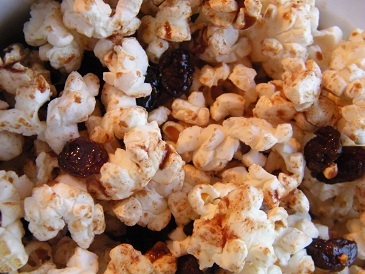 This cinnamon raisin popcorn was lightly buttery with undertones of cinnamon. Sugar-coated raisins peeked out through the pieces of popcorn. It was so good, I may even go make more now. 1- Add the coconut oil to a frying pan. Put one kernel of corn in the pan when the coconut oil melts. Then put the top on and the waiting game begins. When the kernel finally pops add the rest of the kernels in and shake the pan back and forth while the other kernels start popping. Take it off the heat as soon as you stop hearing the kernels pop. 2- Melt the imitation butter and then add the cinnamon, sugar, and raisins to it. Mix well and then pour the sugar-raisin combination on top of the popcorn and toss until all of the kernels have been coated. The raisins will want to sink to the bottom, so make sure to sprinkle them on top. You will not regret making this popcorn dessert/snack, unless you’ve become addicted to eating it, like me. 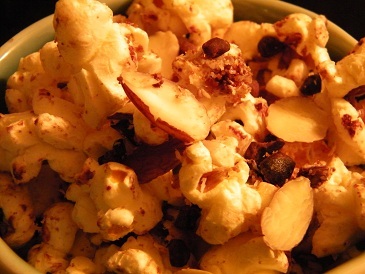 In case you missed my other post on almond joy popcorn, find it here. Another delicious choice. What is your favorite way to season popcorn? Who can resist pie? Certainly not me. Of course, I say this as I wait for my blueberry apple crisp to finish baking. I smell the aromas of cinnamon and apple making their way through the kitchen. Based on scent alone, this cobbler already promises to please the taste buds. Yes, I know cobbler isn’t the same as pie. I like to think of cobbler as pie’s easy-going sibling. There is no need to take out the rolling pin, obsess about whether the pie crust is flaky enough, or ponder how you should cover the pie. Cobbler is almost always a sure thing and for someone who is indecisive, cobbler removes the many questions that pie invites. Now, I know some of you are probably die-hard pie fans. You’re probably thinking, “Why did she go and screw up an all-American apple pie by adding blueberries and an oatmeal-crisp topping?” Simply put, it delivered delicious results. Sometimes even an old favorite needs a new spin. Which do you prefer to make and eat, pie or cobbler? I vote cobbler and yes, I did just finish eating my portion before I submitting this post. Obviously, I have my priorities in order. Read on for the recipe. The fruit that inspired this tasty dessert. 1- Preheat the oven to 350 degrees. Dice the apples, then add then add them to a small mixing bowl. Add the teaspoon of sucanat and the cinnamon and stir. Divide the mixture evenly between two small baking ramekins (mine were about 4 inches in diameter), or if you don’t have ramekins you can use a loaf pan. 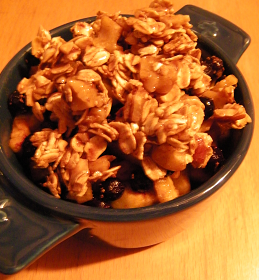 2- In the same bowl (after portioning out the apple mixture), mix the blueberries with the half teaspoon of sucanat. 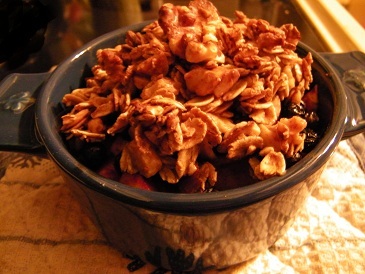 Add those to the ramekins by spooning the sweetened berries atop the apples. 3- Add all of the ingredients for the topping into the same small mixing bowl. Mix well and then spoon onto the top of the blueberries. 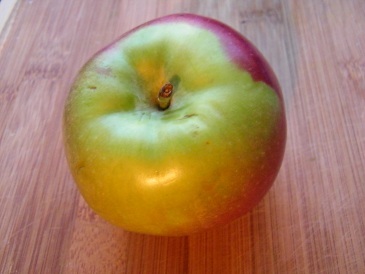 Bake for 20 minutes, or until the crust becomes golden brown and the apples become soft. Let the cobbler cool for about 5 minutes before serving. Easy, delicious, and fairly healthy. A chocolate and nut butter fudge-like coating covered the frozen banana slices, which I topped with slightly bitter cacao nibs. These weren’t overly sweet, as the mister pointed out. He was hoping for something that reminded him of a candy bar like taste. If you’re looking for that added sweetness I would add more sweetener as needed and taste as you go. For me, the sweetness was perfect. As I bit into my chocolate covered banana slice, it seemed like I was eating a creamy banana popsicle coated with fudge. I’ll take it as an after dinner snack any day! Read on for the recipe! 1- Cover a baking sheet with parchment paper. Then, slice your bananas and set them off to the side. 2- Add the almond butter, cocoa powder, coconut sugar, coconut oil, and agave nectar to a bowl. Mix together. At this point, the nut butter mixture will be very thick. Add one tablespoon of almond milk at a time until the batter reaches a consistency, which will allow you to coat the banana slices. 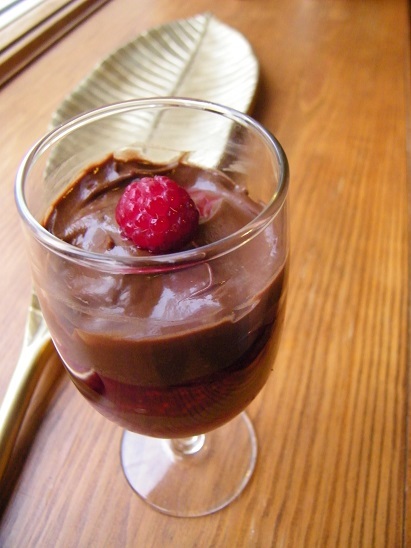 I added three tablespoons of almond milk and the consistency of the chocolate mixture was similar to that of brownie batter, but a little thicker. 3- Either add all of the banana slices to the batter and stir them up and take them out one at a time with a fork OR you can place them in the batter and coat them one at a time (pulling them out with a fork). I tried both techniques. The first was a bit faster. 4- Top with cacao nibs and freeze for 1.5 hours (they are still great after a day+ in the freezer, just don’t let them sit out too long). *NOTE: Don’t let these sit out too long or they will become melted and soft. These would be perfect as a sweet after dinner dessert or to take to a family picnic as the weather gets warmer. Let me know what you think!